As of today (Wednesday) at 12:30 pm EST, the TF has broken through and is now trading below this year's strong uptrending channel, as shown on the 4-Hour chartgrid below of the YM, ES, NQ & TF. 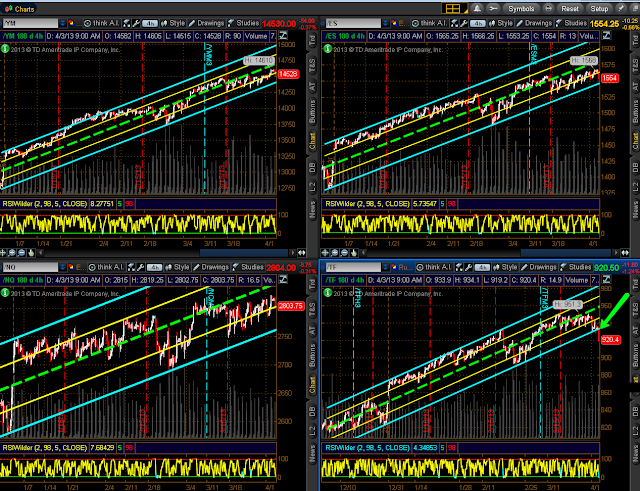 We now see a series of lower lows and highs on the TF, but not yet on the others. Any retest of and failure at the bottom of the channel by the TF will likely produce a drag (and possible pullback/correction) on the other three. UPDATE 2:00 pm EST -- The last swing low of 1552.50 (and uptrend) has now been broken on the ES 4 Hr. as it is approaching the bottom of its channel at 1546ish.